Where do you look when aging pipes burst or sinks begin to overflow in your Maitland home? Do you know where to call when a water main breaks or a leak begins to spout at some inconvenient time in the night? Plumbing repairs are an unanticipated problem that can spring up in your home or business quite suddenly. Once this happens, you need to call your Emergency Plumber in Maitland, FL to fix the issue instantly. Are you looking for a reliable Plumber in Maitland? In case you are in need of the services of expert Maitland Plumbers, always turn to A1 Service Plumbing. We are your number one provider of plumbing services in Maitland, FL. You can always depend on A1 Plumbing Service to fix the plumbing issue. A1 Plumbing Service is the foremost provider of emergency plumbing services in Maitland. We also offer Maitland 24 hour plumbing services. We are always ready to offer an appropriate fix to all of your plumbing needs, be it minor or major. We will work round the clock to fix the issue. We will ensure that your plumbing system is restored to the best working condition. At A1 Plumbing Service, when it comes to the plumbing in your home or business, we understand the importance of prompt service and speedy repairs. We major in emergency Maitland plumbing services ranging from water main breaks to urinals, 3-bay sinks, water coolers to disposals, backflow test, repairs, and installations. We also offer other plumbing services like electric sewer cleaning, sewer jetting, camera lines, lavatory sinks, and so forth. Anytime you have an emergency issue, our expert Plumbers in Maitland will get it sorted out once and for all. Even if you have plumbing issues such as wall leaks, slab leaks, hidden leaks, we can get it done. At A1 Plumbing Service, we understand that time, as well as value and quality, is a crucial aspect of maintenance and repairs. That is why we always respond to every service call within 24 hours, thereby guaranteeing a quick and reliable Maitland emergency plumber. When any part of your property leaks, clogs, blocks, or busts, you deserve immediate attention to halt a problem in its tracks before it can worsen. Knowing the right 24-hour plumber in Maitland and the surrounding areas can mean immediate relief for both your property and your wallet. A1 Service Plumbing is available 24 hours a day and 7 days a week. Once you notice a noisy foul-smelling tank, cold or discolored water, or a sudden unexplained increase in energy bills, it is possible that you have an emergency plumbing issue. Do not hesitate to contact us at A1 Service Plumbing. 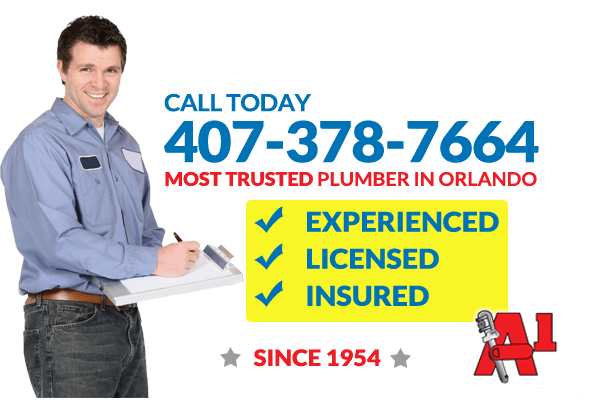 We are your 24-hour plumber in Maitland that is always ready to help carry out a comprehensive inspection and fix on your entire plumbing system. At A1 Plumbing Service, there isn’t a job that we consider too big or too small regarding plumbing in Maitland. We work with a team of competent, well-trained plumbing professionals that are always dedicated to serving you. Whether it be a small leak or a major disaster, A-1 Plumbing Service prides itself on being accessible to our clients throughout the day. We are well aware of the importance of having working sewage pipes, proper hot water, and reliable drainage, we will ensure that the entire plumbing system in your Maitland, FL home is in optimal working condition. We pride ourselves on being the most reliable 24-hour plumber in Maitland. A-1 Plumbing Service offers the best customer service you could anticipate from any plumbing company in Maitland. The manner through which your plumbing issue and other plumbing projects will be resolved will exceed your expectations. This is what makes us distinct from other Plumbers in Maitland. Estimates, installations, emergency repairs and routine maintenance are all included in the vast range of services provided for both your residential and commercial property. For added value with your plumbing needs, visit our website for a selection of printable coupons and daily specials. It is our goal to provide a quality product with superior service at affordable rates. Even if you are on a tight budget, we are always ready and willing to help. Do not wait until your plumbing system completely breaks down before you call a professional plumber in Maitland to fix the issue. Call us today once you notice a leaking pipe in your home. We remain the most trusted emergency plumber in Maitland. Over half a century of experience stands behind our work. A widespread community of satisfied customers is the central motivation behind A1 Service Plumbing. Call today for immediate and effective results. With us, your plumbing issues just became a thing of the past.